Alliant Energy Center Master Plan Committee unveils draft District Vision and Strategy Oct 15 | Vandewalle & Associates, Inc. 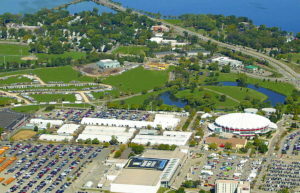 The draft Alliant Energy Center Campus Master Plan and draft Destination District Vision & Strategy for the surrounding area will be presented to the community on Monday, October 15. Hosted by the Dane County Alliant Energy Center Master Planning Oversight Committee with presentations from Perkins & Will and Vandewalle & Associates, the meeting will be held at the Alliant Energy Center Exhibition Hall in the Mendota Rooms 5&6. Doors open at 5 pm and beverages and hors d’oeuvres will be provided. The event will kick off at 5:30 p.m. and end at 7:00 p.m. just in time to get home for the Packers game. Vandewalle & Associates will present the Destination District Vision and Strategy including ideas, key project concepts and strategies for moving forward. Perkins & Will will present the Master Plan for the Alliant Energy Center itself. This is a pivotal, “Big Idea” moment in the long-term master planning and redevelopment process for Dane County’s Alliant Energy Center and the surrounding district. The AEC campus is the region’s premier, multi-venue expo, convention and event destination, providing a place for major events that attract visitors from across the country and around the world. The project is part of a broad effort to transform the property into a catalyst for economic development by attracting more visitors, creating a destination district, and providing new opportunities for the adjacent neighborhoods in south Madison.